It’s officially the end of the service year and time for us to sign off on the blog for the summer. But before we do that, I’d like to introduce myself. My name is Aliyah Turrentine and I’m a first-year adviser serving the prestigious Scotland High School in Laurinburg, North Carolina. I’d like to start by saying that my students are amazing and have completely warmed my heart this year. It was a privilege to see them off at graduation last Saturday. On June 4th and 5th, I attended the Carolina College Advising Corps End of Year Retreat in Chapel Hill. I spent two days engaging in fellowship with first, second, and third-year advisers. This felt like our last time meeting as a family since many of our second-year advisers are off to graduate school or new jobs. This year’s retreat was extremely impactful and meaningful for me. We closed out the year with empowering key note speakers, adviser led sessions, good food, and fellowship. On the first day, we had our own kind of “Decision Day.” The second-year advisers were invited to wear the colors of their future graduate schools which was really cool. We ended lunch with shout-outs to recognize our fellow advisers. It got a bit emotional but it was meaningful for us to share so much love around the room. The returning and non-returning advisers then split up. While the non-returning advisers participated in a mentoring session, the returners customized mugs for the non-returners and went over details for summer training. That evening we had a food truck style dinner and listened to throwback jams surrounded by friends. Mr. Downing shared that there are three types of people: those that complain about their life, those that let life happen to them, and those that take action. I’m proud to serve alongside so many people who are “taking action” and also practicing grace, humility, and gratitude along the way. Thanks for being a reader and tuning into our blog. I hope this has given you a glimpse of the family that I am connected with as a Carolina College Advising Corps adviser. 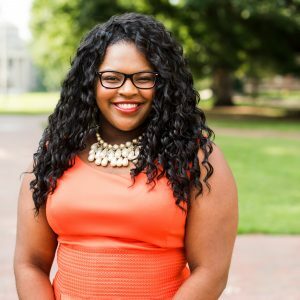 Signing off, Aliyah Turrentine, first-year adviser at the one and only Scotland High School.